The United States Congress designated the Cabeza Prieta Wilderness (map) in 1990 and it now has a total of 803,418 acres. All of this wilderness is located in Arizona and is managed by the Fish and Wildlife Service. 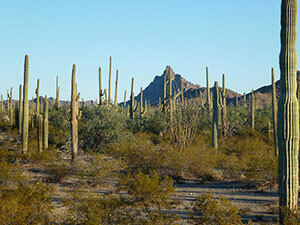 The Cabeza Prieta Wilderness is bordered by the Organ Pipe Cactus Wilderness to the east. Cabeza Prieta Wilderness has the distinction of being Arizona's largest Wilderness Area, encompassing nearly 93 percent of the Cabeza Prieta National Wildlife Refuge. Cabeza Prieta Wilderness spans across isolated and rugged, Sonoran desert landscapes including both the Arizona Uplands and Lower Colorado components which range from 700 to 2,800 feet. Rugged mountains and broad desert valleys, dotted with sand dunes and lava flows, dominate the region. This is a land of solitude, shattered only by the occasional summer monsoon or military overflight. To ensure you are aware of the dangers of unexploded military ordnance, a permit and your signature on a Holdharmless Agreement is required to enter the Wilderness. Due to illegal border crossings by both people looking for work and drug smugglers, the U.S. Customs and Border Patrol actively patrol the wilderness area. Management efforts in the area emphasize the preservation of Sonoran Desert ecosystem and an at risk desert bighorn sheep population. More recently, emphasis has been placed on the endangered Sonoran pronghorn. Their numbers in the U.S. crashed to approximately 20 individuals in 2002 but since have increased to well over 200 animals thanks to an active captive breeding program. During your visit, walk carefully among the cryptogamic soils and watch for desert bighorn sheep, Sonoran pronghorn, mule deer, rabbits, kangaroo rats, pocket gophers, and cactus wrens living among the chollas, creosote bushes, mesquite, ocotillo, and even the occasional elephant tree. Hot and dry, conditions at the refuge are ideal for the Saguaro forest and the many reptiles such as side-blotched lizards, desert horned lizards, Great Basin whiptails, and six species of rattlesnakes. Among these are the sidewinders, Mojave, and western diamondback rattlers. Bordered by Organ Pipe Cactus National Monument to the south and east, and the Barry M. Goldwater Range to the west and north, the Wilderness Area offers brilliant night skies, unmatched desert scenery, and a deafening desert silence. Rare experiences include a walk on a prehistoric trail, a glimpse of an endangered Sonoran pronghorn sprinting across playa lakes, and the opportunity to see wildlife and desert fauna indicative of Southwest Arizona. Across the southern half of the refuge runs an active 4-wheel-drive trail (a non-wilderness corridor), and the remains of El Camino del Diablo (The Devil's Highway), a trail first blazed in 1540. This infamous trail once connected Sonora, Mexico to California and now provides access to the Wilderness. At the Refuge visitor center, you can sign the required military hold harmless agreement. The greatest obstacles to your safety include possible encounters with old mine shafts, unexploded military ordnance, illegal border activity, and a rugged, unforgiving landscape where summer temperatures routinely range above 105 degrees F during the day and remain above 90 degrees F at night between May and October. Water is scarce everywhere out here (as little as 3 inches of annual precipitation on the west side), even for the wildlife. Hikers will find no maintained trails. You must bring your own water, at least 1 to 1 ½ gallons per person per day on cool days of 100 degrees or lower. In addition, Cabeza Prieta shares 56 miles of border with Mexico. Illegal smuggling activities are common and visitors should take all necessary safety precautions. Illegal activities can occur anywhere within the refuge. The best time to visit is during the winter months, especially following a wet year, by desert standards, when the desert wildflowers are in bloom. In the winter, carry extra clothing for cold nights. Dress in layers and be prepared for temperatures which may drop down into the 30 degree range. Lightweight rain gear and sturdy hiking shoes may add comfort to your trip during sudden thunderstorms or cross country hikes through cactus and cholla bajadas. Planning to Visit the Cabeza Prieta Wilderness? How to follow the seven standard Leave No Trace principles differs in different parts of the country (desert vs. Rocky Mountains). Click on any of the principles listed below to learn more about how they apply in the Cabeza Prieta Wilderness.